” Laughter is a moment when our mind refuses to reason. When we are puzzled by certain things, our mind simply doesn’t want to struggle, or perhaps we don’t know how to think, therefore we just want to forget it. I appreciate artworks with attention to detail and visual commentary. It reflects dedication, patience and intellectual thought, the three fundamental ingredients (in my opinion) to be successful in anything that you do. During my recent visit to Tujuh Bintang Art Space in Jogjakarta, I came across ‘Merdeka’ by Budi Ubrux. 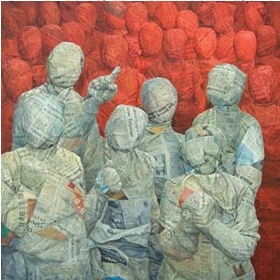 Budi paints figures that are mummified in ‘daily newspapers’, expressing his concerns that if we were to rely literally on the information carried by our daily newspapers (which are often sensationalised) we will be absorbed into mediated realities, blinding us from the truth and blocking us from a balanced interpretation of the real world. I marvel at his patience and technical proficiency in meticulously detailing the ‘text lines’ and capturing the light and shadows to project the crumple, crease and irregular folds of the body-wrapped newspaper. 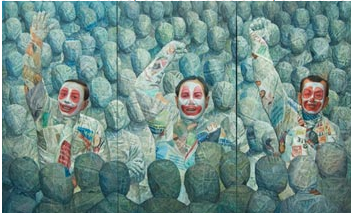 He has also intelligently chose the right headlines and pictures to subtly communicate its sensationalized and dramatic nature. 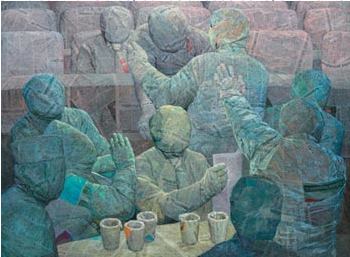 My interpretation of this work is a group of men posing to celebrate their phenomenal conquest (or success), or what they perceived as such, in mediated reality. The reality or truth is in the fish, who is being conquered and being used as an object of pride and will end up being consumed.